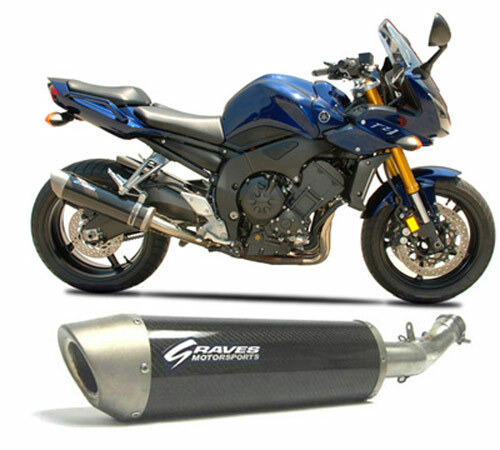 Graves Motorsports Yamaha FZ1 Cat Eliminator Slip-On Exhaust System. Graves Motorsports FZ1 exhaust is hand-made in the USA! This slip-on exhaust system for the 06-14 Yamaha FZ1 provides HUGE gains in horsepower (+6hp) and torque (+5ft-lbs). These gains are achieved while eliminating 11 lbs of dead weight, all while retaining the center stand! This high performance exhaust system features stainless steel tubing with your choice of Carbon Fiber or Titanium Silencers. Graves Silencers feature conical Titanium endcaps. Select from "Carbon" or "Titanium" silencers and "Standard" end caps or a "Polished" Showstopper end caps from the pull down menu when ordering. Stock Slip-On Exhaust System = 15.6 lbs.